Many of you would have known by now that the Thirumeni of Sri Anantha Padamanabar is made of Nava Rathnams (Gold, diamond, gems, vaiduryam and lots more) This was discovered recently when Pothis (Archakas are called as Pothis in Malai Nadu divya desams) saw some shine in one of the hands of Perumal while doing Thirumanjanam to moolavar. When they started cleaning, to their amazement, they found that complete thirumeni of perumal is full of gold and nava rathnams (This was covered with some black element some centuries back to protect perumal from invaders). Of all the Sayana Perumals, the one at this Kshetra is the largest. To have complete darshan of the Siras(Head), body and Pada(Feet), one has to view from the three entrances. On the south side of the compound there is a Sannadhi for Yoga Nrisimha with Hanuman in front and Krishna at the rear of the Sannadhi. The temple for Lakshmi Hayagriva and Srinivasa is on the south side. As per the Sthala purana , at the request of Diwakara yogi, Lord took the huge form of the size of Tridanda so as to have darshan from the three entrances. Anantasayana vrada is considered very important here. Approach : This temple is located on the capital city of Kerala.It is well connected by Road and Rail. Theertham - Matsya Theertham, Padma Theertham, Varraha Theertham. Nammalwar - 3678 - 3688. The Lord must be worshipped from 3 Gates.This 3-gate system applies to the previous Kshetra also. A temple for Sri Anantha Padmanabha Swamy has also been constructed at Adayar, Chennai; modelled behind this Kshetra. Entry into the sanctum sanctorum permitted only without shirt or banians. Legend says that the entire state of Kerala is under the control of this Lord. Being a capital city, it has all the facilities. The Moolavar of this Thiruvanandhapura Kshetram is Sri Anantha Padmanabhan. Moolavar is found in Kidantha (sleeping) kolam in Bhujangha Sayanam and facing his thirumugham along the Eastern direction. 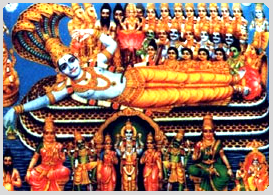 He gave his Prathyaksham for Indiran, Chandiran (the moon god) and Ekadesai Ruthraas. This is one of the most famous Divyadesam found in the State of Kerala. It is found 3/4 kms away from the Thiruvananthapuram Central Railway Station. Lots of bus and train facilities are available. Special trains run from Chennai - Thiruvananthapuram. This place is also named as "Trivandrum". Lots of boarding and lodging facilities are also available.